Beth Enson has been a home visitor for five years. She loves connecting with people in the life-changing process of becoming parents. Home visiting provides a chance to talk, feel and reflect about the experiences we have with our kids and that they have with us, experiences that allow us to know ourselves on the most profound level. She is inspired to help parents gather the support and awareness they need to be present with all the big feelings their kids navigate. The Circle of Security approach taught by First Steps has had a huge, positive impact on her own parenting, and she loves teaching this approach to her clients. Beth is also certified to teach Infant Massage, and holds her Level 2 certification as an Infant Mental Health specialist. 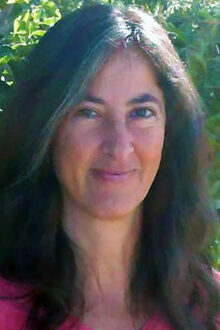 She was born and raised in Brooklyn, NY, and moved to Taos in 1993. Prior to Home Visiting, she worked at the Northern NM Birth Center and the National College of Midwifery. In addition to Home Visiting, she writes poetry, raises vegetables, helps plant community orchards, teaches Co-Counseling, works on issues of racism and white privilege, and co-parents an amazing young adult with her partner of 25 years.